In college, you are often asked about your plans for after graduation. Some people might even ask if you are working while in school. While both of those questions can make many college students cringe, they do give us something to think about. Should you have a job or internship? During college? After college? I am fortunate enough to have a job while in college, and it is even on campus, so I don’t have to worry about leaving school to go to work. I am also lucky that my job is in an industry that I am interested in. It will give me experience to get a job I want after I graduate. 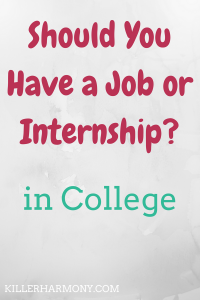 Two options for gaining that experience during and after college include a traditional job and an internship. So, which one is right for you? Getting a traditional job is a great way to make some money. That is what most jobs are for, after all. The drawback that comes with a regular job, especially for college students and recent graduates, is that the jobs you qualify for aren’t always going to be relevant to your field of study. Jobs can provide experience to harness certain skill sets that you might not have a chance to work on otherwise. If you end up with a job in retail or food service, you will learn a lot of customer service and people skills. Those jobs can also help improve your attention to detail, from folding shirts to handling money. Internships are a great way to learn about an industry that you want to work in, and you can even get class credit. The main problem with internships is that they are usually unpaid. You will be spending time working, but you will still need some other way of paying for expenses. If you have a decent amount of money in savings or other financial assistance, an internship can be a smart thing to do. You can talk to your school about getting class credit, and it can go on your resume for when you apply to paying positions. If you can’t afford to work and not get paid, an internship can just be a huge and unnecessary hassle. Your time is valuable, and you have to decide if an internship is worth it. Traditional jobs are paid, but may not be relevant to your future career. Internships are relevant to your career, but you still need to work somewhere to earn money. If you are lucky enough to find a paid internship or to get a job in a field that interests you, take it. The money will help you pay for expenses, and the industry experience will set you above others when you apply for jobs in the future. This post was a bit shorter than my normal posts, but this week has been busy. I didn’t get to work on my blog as much as I wanted to, but I hope this post is helpful. Jobs and internships are both very appealing to students and recent graduates, but they are different. Have you had a job or internship? What was your experience like? Let me know in the comments or on Twitter (@HannahHaefele)!